Hello Everyone, It's Girl Scout Week - and what does that mean? It means that while Girl Scouts across the country celebrate 98 years of community service, we remain committed to helping make the world a better place. Girl Scouts salutes all for their dedication to and support of the positive development of girls everywhere. Girl Scouting builds girls of courage, confidence, and character. Serving as a Girl Scout today means being part of a worldwide organization that builds leadership skills by providing girls with opportunities to discover their interests, connect with others, and take action. 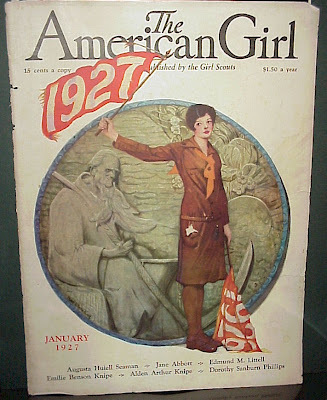 March 12, 2010, marks the 98th anniversary of Girl Scouting. During Girl Scout Week, which runs from March 7 through 13, Girl Scouts of all ages celebrate by demonstrating leadership and commitment in ways that have a real impact on their communities. Girl Scouts is proud that change is one of our greatest traditions. We continue to keep in step with girls’ needs while remaining true to the core values of the Girl Scout Movement. Indeed, when a girl becomes a Girl Scout, she promises to try to help people at all times and this has been so since the early years of the Girl Scout Movement. That promise is actualized everyday through a vast array of community service projects in which Girl Scouts help make the world, and our community, a better place. We thank all the volunteers and members in our community for their time, talent, and financial support. That spirit of volunteerism and support makes it possible for us to continue to be the best leadership experience for girls—today, tomorrow, and always. I will be celebrating Girl Scout Week by only posting stories relating to Girl Scout Week activities and related news pieces from across the country! How will you celebrate Girl Scout Week?